Here you can purchase our famed Smoothieboard controller as well as any related accessories you might need. We also sell full digital fabrication machines with the Smoothieboard controller pre-integrated, for example Laser cutters, CNC mills and giant 3D printers. If you are looking for a machine not listed here or need help with anything, don't hesitate to contact us. The Smoothie project is built by a very large community of volunteer contributors from all around the world. 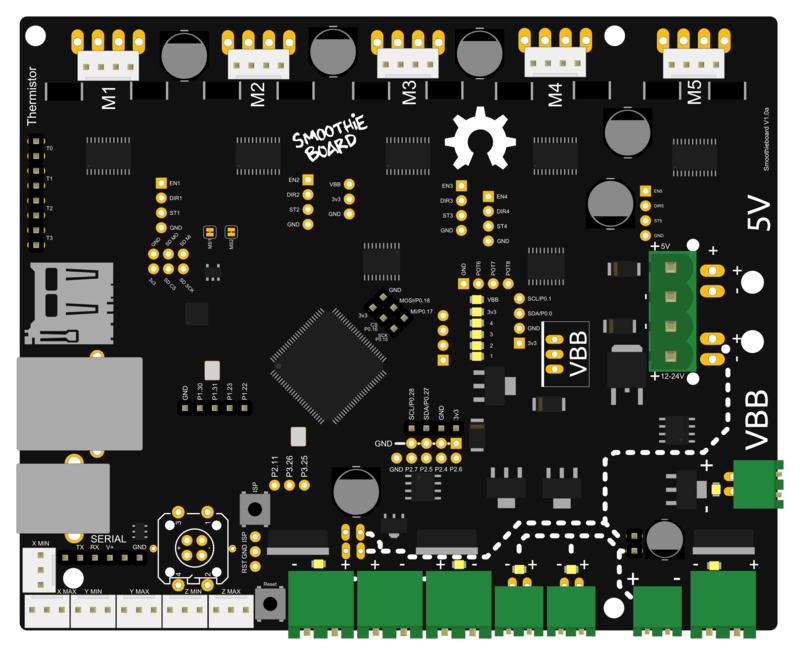 The project consists of a controller board, the « brain » of your digital fabrication machine, and the firmware which is the software that runs on it. Our company participates in the project, and produces, tests and sells the Smoothieboard controller. Modular construction means it can control many machine types : lasers, CNC mills, 3D printers and many more. Also means it's easier to adapt it to do new things. Easy configuration : no editing source code or compiling as with common alternatives. We also sell full machines with our system pre-installed. This allows us to provide you with machines at a lower price while still maintaining a high level of quality, functionality and features. We handle everything for you including delivery, installation and teaching you everything about the machine. We are also capable of customizing the machines to your needs, simply drop us a message. Smoothie-powered laser cutter with 90W long-life RECI laser tube. 600 x 400 mm work area. Smoothie-powered laser cutter with 90W long-life RECI laser tube. Découpeuse laser contrôlée par Smoothie avec tube laser RECI longue durée (de 90 Watts à 150 Watts). Smoothie-powered CNC router with 1.5kw watercooled spindle. 600 x 900 mm work area. 90mm Z travel. Smoothie-powered CNC router with 2.2kw watercooled spindle. 1300 x 1300 mm work area. 150 mm Z travel. Smoothie-powered CNC router with 3kw watercooled spindle. 2500 x 1300 mm work area. 160 mm Z travel.